Building a piece of software to manage users is easy, but only if you know exactly what you want. After all, most of the code inside the various existing ASP.NET providers consists of straightforward parameter validation and data access. While this membership code is simple in isolation, there is still value inside the existing providers. The providers have proven themselves in production for thousands of web sites. Unfortunately, it is difficult to derive value from the existing providers and reuse just the parts you need when building a custom membership solution for an application. The providers entangle a number of responsibilities and require a relational database. This has always been a source of frustration when building YACMP (yet another custom membership provider). My typical approach is to start from scratch by deriving from the abstract MembershipProvider class. 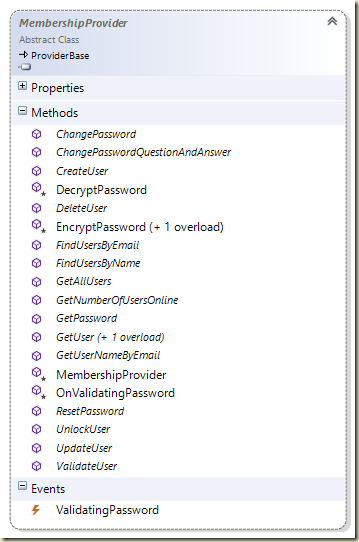 However, starting with the abstract MembershipProvider class doesn’t give me any inherent benefits in an ASP.NET MVC or Web API application. There are no custom controls to drag from the toolbox that will automatically integrate with a custom provider, and other than the Authorize attribute (which works against the roles provider), there is no implicit dependency on Membership.Provider or Roles.Provider, which are the typical static gateways to membership and role features. There are actually drawbacks to building custom providers with ASP.NET MVC. The provider model doesn’t easily cooperate with the dependency resolution features of MVC and Web API. Also, the API is a bit dated and doesn’t have the ability to work with OAuth or OpenID. The solution to the OAuth problem in a new MVC 4 Internet application is to combine a new membership provider (the SimpleMembershipProvider) with some Web Matrix bits (the WebSecurity class) into something that works with OAuth and still allows a user to register locally with a password, but unfortunately still depends on a relational database and is complicated to understand, extend, and debug (search for MVC 4 SimpleMembership and you’ll find more questions on StackOverflow than anything else). Given that the traditional provider model doesn’t provide many benefits for MVC and WebAPI, what would it look like to build a membership system and not start by deriving from MembershipProvider? That’s the topic for the next post. lol, what a tease, Scott. I tend to go with just a simple IAuthenticationProvider that I inject into my controller. All that is required is Validate(username, password), Login and Logout. The implementation can then get some db-access or similar injected, and you can use FormsAuthentication to set the authcookie. 1) Not everyone needs full control over the database. Most people want to avoid low level database code. 2) One advantage is a smaller code base. No need to use ADO.NET directly. 4) Yes, Microsoft kills off more released products than most companies can release products. Second #1)You can still use WebForms if you like it better. I just wanted to say that I have been reading for a a couple of days and I would like to sign up for the updated feed. We've used WebForms for a couple of years and switched one customer to MVC now, and we can state: We will never step back to WebForms, MVC is really nice and i recommend everyone considering taking a look into it.